I mentioned a few months back that I was working on my capstone project for my degree this semester. I’ve mostly finished it up (just adjusting some formatting), so I thought it would be a good moment to post on my project and some of my findings. Since I have to present this all in a week or two, it’s a good moment to gather my thoughts as well. The American Time Use Survey is a national survey carried out by the Bureau of Labor Statistics that surveys Americans about how they spend their time. From 2014-2016 they administered a survey module that asked specifically about health status and behaviors. They make the questionnaire and data files publicly available here. What interested me about this data set is that they asked specifically about food insecurity….i.e. “Which of the following statements best describes the amount of food eaten in your household in the last 30 days – enough food to eat, sometimes not enough to eat, or often not enough to eat?” Based on that data, I was able to compare those who were food secure (those who said “I had enough food to eat”) vs the food insecure (those who said they “sometimes” or “frequently” did not have enough to eat. Yes, the paradox is true for this data set. Those who were “sometimes” or “frequently” food insecure were almost 2 BMI points heavier than those who were food secure…around 10-15 pounds for most height ranges. Level of food insecurity didn’t seem to matter, and the effect persisted even after controlling for public assistance and income. Interestingly, my professor asked me if the BMI difference was due more to food insecure people being shorter (indicating a possible nutritional deficiency) or from being heavier, and it turns out it’s both. The food insecure group was about an inch shorter and 8 lbs heavier than the food secure group. Health status People who were food insecure were WAY more likely to say they were in poor health. This isn’t terribly surprising since disability would impact people’s assessment of their health status and ability to work/earn a living. Shopping habits While most people from both groups did their grocery shopping at grocery stores, food insecure people were more likely to use other stores like “supercenters” (i.e. Walmart or Target) and convenience stores or “other” types of stores. Food secure people were more likely to use places like Costco or Sam’s Club. Unsurprisingly, people who were food insecure were much more likely to say they selected their stores based on the prices. My brother had asked specifically up front if “food deserts” were an issue, so I did note that the two groups answered “location” was a factor in their shopping at equal rates. Soda consumption Food insecure people were much more likely to have drank soda in the last 7 days (50% vs 38%) and much less likely to say it was a diet soda (40% vs 21.5%) than the food secure group. Exercise Food insecure people were much less likely to have exercised in the last 7 days (50.5%) than food secure people were (63.9%). Given the health status ranking, this doesn’t seem surprising. Food shopping/preparation Food insecure people were much more likely to be the primary food shopper and preparer. This makes sense when you consider that food insecurity is a self reported metric. If you’re the one looking at the bills, you’re probably more likely to feel insecure than if you’re not. Other researchers have noted that many food stamp recipients will also cut their own intake to make sure their children have enough food. Yes, I have confidence intervals for all of these, but I’m sparing you. Time spent eating Interestingly, increased time spent eating was actually associated with lower BMIs. This may indicate that people who can plan regular meal times might be healthier than those eating while doing other things (the survey asked about both). Poor health The worse the self assessed health, the higher the BMI. It’s hard to tease out the correlation/causation here. Are people in bad health due to an obesity related illness (like diabetes) or are they obese because they have an issue that makes it hard for them to move (like a back injury)? Regardless, this correlation was QUITE strong: people in “excellent” health had BMIs almost 5 points lower than those in “poor” health. Being the primary shopper I’m not clear on why this association exists, but primary shoppers were 2 BMI points heavier than those that shared shopping duties. Public assistance Those who were food insecure AND received public assistance were heavier than those who were just food insecure. It should be noted that I did nothing to establish causality here, everything reported is just an association. Additionally, it’s interesting to note a few things that didn’t show up here: fast food consumption, shopping locations and snacking all didn’t make much of a difference. While none of this is definitive, I thought it was an interesting exploration in to the topic. I have like 30 pages of this stuff, so I can definitely clarify anything I didn’t go in to. Now to put my presentation together and be done with this! I was perusing Twitter this past weekend when I started to see some concerning headlines float by. While I know polls frequently grab headlines by playing on people’s political ignorance, this seemed to go a step beyond that. 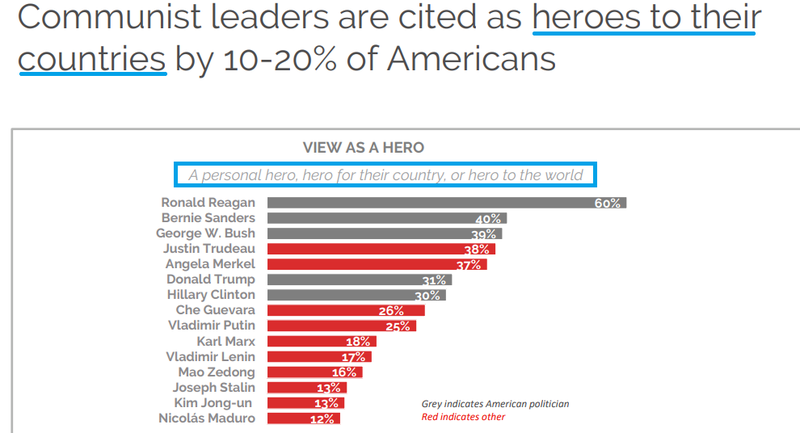 I had trouble wrapping my head around the idea that anyone in the US could list Stalin, Lenin or Jong-Un as a hero, let alone 20-25%. I had to go see what question prompted such an odd set of results. I think the “hero for their country” part is key. That asks people to assess not just their own feelings, but what they know about the feelings of a whole other country. Interestingly, I decided to look up Kim Jong-un’s in-country approval rating, and some defectors put it as high as 50%. According to one poll, 38% of Russians consider Josef Stalin to be the “most outstanding person” in world history. You could certainly debate if those polls had problems in wording, sample or other methodology, but the idea that a 25 year old in the US might see a headline like that and conclude that Russians really did like Stalin doesn’t seem outside the realm of possibility. Indeed, further down the report we find out that only 6% of millenials in the US state that they personally have a favorable view of Stalin. That’s lizard people territory folks. In this case, it appears the polling company was actually pretty responsible about how they reported things, so it’s disappointing that further reports dropped the “in their country” piece. In my ongoing quest to name different biases and weird ways of skewing data, I’m now wondering what to name this one. What do you call it when someone asks a poll question in a way that encompasses a variety of scenarios, then the later reports shorten the question to make it sound like a different question was answered? I’m gonna work on this. I got an interesting question from the Assistant Village Idiot recently, pointing me to this blog post1 on materialism and post-materialism in various countries by year, wealth of nation, wealth of individual, age and education level of respondent. It’s an interesting compilation of graphs and research that seem to show us, as a world, moving from a materialistic mindset, to a post-materialistic mindset. So what does that mean and what’s my take? People then receive a score between 1 and 3. If you pick both materialist options (#1 and #3), you get a score of 1. If you pick both post-materialist options (#2 and #4), you get a score 3. If you pick one of each, you get a score of 2. So what are we seeing? Every country in the world scores (on average) between a 1.4 and a 2.2. There were also graphs that showed that higher class people moved toward post-materialist mindset, and that the world as a whole has been moving towards it over the years. I do think it’s worth noting that only about 8 countries score over a 2, with a few more on the line. 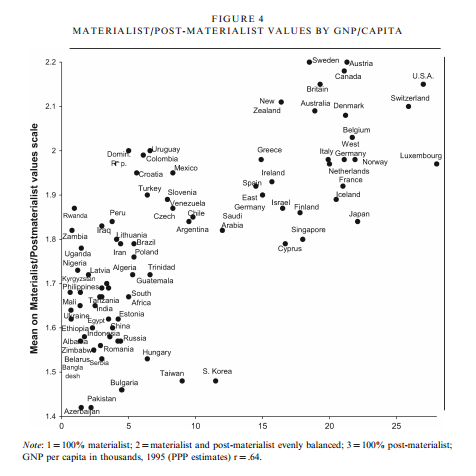 On the whole, more countries skew materialist than post-materialist on this scale…..though the 8 that are higher are all fairly high on the development index. Well, it seems to be a matter of focus. In my opinion, these questions seem to serve as a proxy for current concerns as much as actual preferences. For example, I did not rank “fighting rising prices” very high, but I also live in a country that has only slow inflation for most of my life. Essentially, this appears to be a sort of political Maslow’s hierarchy of needs. It’s most likely not that people don’t care about safety or price stability, but rather they don’t prioritize it if they already have it. Additionally, I would suspect that many people would argue that they like free speech because it maintains order in a country, as opposed to actually desiring free speech over order. Most of the data comes from one particular researcher, Ronald Inglehart, who focuses on changing values and theorizing what impact that might have on society. Inglehart is not particularly hypothesizing that being post-materialist is bad, but rather that it represents a departure from the way most people have lived for thousands of years. Because it appears our values slant is set earlier in life, he proposes that those of us growing up in relative safety and security will always bias towards a post-materialist focus. He researches what effect that may have on society. While some of this may seem obvious, he brings up a couple related outcomes that were fairly subtle. For instance, he points out in this paper that we have seen a reduction in voting stratified by social class, and an increase in voting stratified around social issues. This suggests that even a very basic level of security like the type provided by our welfare systems allows people more time to focus on their values and ideals. It varied by country, but in the US there was almost NO difference in materialist/post-materialist values by education class. This was an interesting point, because I think many people are troubled by how contentious some of our social issue debates have gotten (abortion, women’s rights, the environmental movement, etc) have all gotten. The idea that these issues are now more contentious because more people are devoting more thought to them is intriguing. Additionally, it seems that there would be less national agreement on those types of issues in comparison to safety and security issues. If your country is under attack, there is no debate about defending yourself. We may debate the method, but the outcome is widely agreed upon. With social issues that’s not true. What effect this will have on country level stability is unknown. Interesting stuff to keep an eye on going forward, and keep in mind this election season. I ran across an interesting article from Quartz today that serves as an interesting warning for those attempting to compare cross-cultural survey results. People from multiple countries were asked the same question “Would you personally accept a refugee into your own home?”, and the results were compared to find the “most welcoming” country. China came out ahead by a large margin: 46% of residents said yes, as compared to 15% of US residents. However, when the question was more closely examined, it was discovered that the English word “refugee” does not have an exact translation in Chinese. While in the US “refugee” almost always refers to someone from another country, in Chinese the word has a more neutral “person who has experienced a calamity” definition. Depending on the situation, it is then modified with either “domestic” or “international”. The survey question did not contain either modifier, so it was up to the respondent’s personal interpretation. So basically, people in different countries were answering different questions and then the results were compared. Surveys are already prone to lots of bias, and adding inexact translations into the mix can obviously heighten that effect. Interesting thing to be aware of when reading any research that compares international responses. Note: This is part 9 in a series for high school students about reading and interpreting science on the internet. Read the intro and get the index here, or go back to Part 8 here. The problem is that people are weird. Not any individual really (ed note: this is false, some people really are weird), but collectively we have some issues that add up. Nowhere is this more evident than on surveys. There is something about those things that brings out the worst in us. For example, in this paper from 2013, researchers found that 59% of men and 67% of women in the National Health and Nutrition Examination Survey (NHANES) database had reported calorie intake that were “physiologically implausible” and “incompatible with life”. The NHANES database is incredibly widely used for nutrition research for about 40 years, and these findings have caused some to call for an end to self-reporting in nutrition research. Now I doubt any individual was intending to mislead, but as a group those effects add up. Nutrition isn’t the only field with a problem though. Any field that studies something where people think they can make themselves look better has an issue. For example, the Bureau of Labor Statistic found that most people exaggerate how many hours they work per week. People who say they work 40 hours normally only work 37. People who say they work 75 hours a week typically work about 50. One or two people exaggerating doesn’t make a difference, but when it’s a whole lot of people it adds up. So what kinds of things should we be looking out for? 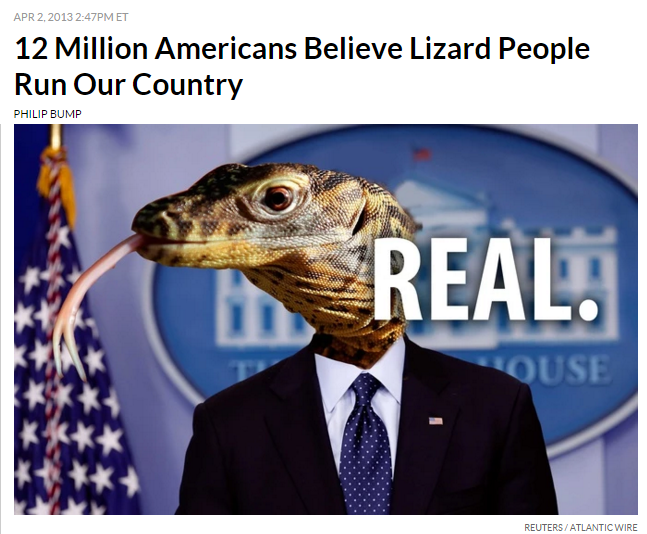 That one’s from a survey about conspiracy theories, and they got that 12 million number from extrapolating out the 4% of respondents to the survey who said they believed in lizard people to the entire US population. In the actual survey, this represented 50 people. Do you think it’s more plausible that the pollsters found 50 people who believed in lizard people or 50 people who thought this was an amusing thing to say yes to? But people who troll polls aren’t the only problem, polling companies play this game too, asking questions designed to grab a headline. For example, recently a poll found that 10% of college graduates believe a woman named Judith Sheindlin sits on the Supreme Court. College graduates were given a list of names and told to pick the one who was a current Supreme Court justice. So what’s the big deal, other than a wrong answer? Well apparently Judith Sheindlin is the real life name of “Judge Judy” a TV show judge. News outlets had a field day with the “college grads think Judge Judy is on the Supreme Court” headlines. However, the original question never used the phrase “Judge Judy”, only the nearly unrecognizable name “Judith Sheindlin. The Washington Post thankfully called this out, but all the headlines had already been run. Putting in a little known celebrity name in your question then writing a headline with the well known name is beyond obnoxious. It’s a question designed to make people look dumb and make everyone reading feel superior. I mean, quick, who is Caryn Elaine Johnson? Thomas Mapother IV? People taking a quiz will often guess things that sound vaguely right or familiar, and I wouldn’t read too much in to it. This one I fully blame on the people reporting things for not giving proper context. This is one area where journalists really don’t seem to be able to help themselves. They want the splashy headline, methodology or accuracy be damned. They’re playing to our worst tendencies and desires….the desire to feel better about yourself. I mean, it’s really just a basic ego boost. If you know that Judge Judy isn’t on the Supreme Court, then you must clearly be smarter than all those people who didn’t right? So watch the questions, watch the wording, watch out for people lying, and watch out for the reporting. Basically, paranoia is just good sense when lizard people really are out to get you. See you in Week 10! Read Part 10 here. I’m headed back to work today. It’s a bit early, but in exchange I get to work part time through Thanksgiving. 84% of working women told ForbesWoman and TheBump that staying home to raise children is a financial luxury they aspire to.What’s more, more than one in three resent their partner for not earning enough to make that dream a reality. Subsequently I saw several bloggers reference the fact that “84% of women want to be stay at home moms”, so I decided to do a little digging. What did this survey really say? Well, Forbes published more about the survey here. So it sounds like at least some of the respondents were focused less on wanting to opt out of the workplace to raise their kids, and more on wanting to have enough money to keep their standard of living while not feeling pressured to work. Two slightly but significantly different things IMHO. I have rarely seen a stay at home mom who didn’t strive to make the household more financially efficient while at home, so this dream seemed a bit divorced from reality. This is backed up by the survey’s additional result that only half of working women think they’d be happier if they stayed home. I’d also guess most of us would be happier if we had enough money to completely call the shots regarding where we worked. Of course none of this addresses the totally skewed sample that comes from two websites joining up to do a survey like this. Doubtless ForbesWomen/TheBump do not attract a random crowd. Additionally, it should be concerning to our sense of family that 1/3 of women are resenting their husbands for not making more money….though to note the survey used the phrase “sometimes resent” while the article merely used “resent”. A side note about this survey….one of the last questions was about how much women spent on themselves per month. Most (63% of working moms, 78% of stay at home mom’s) said they spent less than $100 a month on themselves. Every time I see a question like this, I always wonder where people count cable TV and haircuts. When I was getting my degree, they mentioned that during premarital counseling you should always ask the woman how much she thought a reasonable haircut cost. Apparently that one expenditure can cause a lot of fights. I definitely know women who believe a basic haircut costs $80 or more. All that being said, I’m going to miss my little monkey today, but I’m happy to have a job I love to go back to, I don’t resent my husband, and I think a reasonable haircut for a woman costs $40.